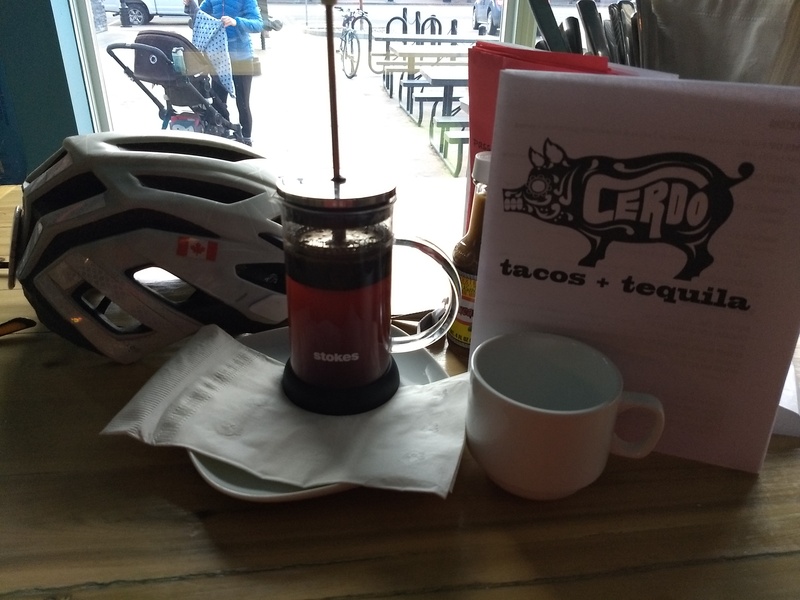 Back to Coffeeneuring again after missing last year due to my bike trip to Portugal. 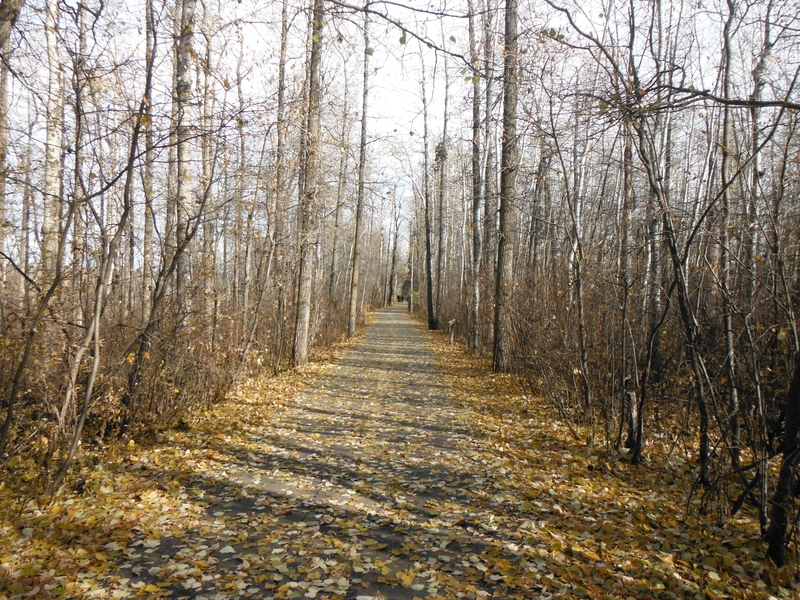 This fall, the weather in Edmonton has been abysmal for biking. Almost the whole of September and early October has been snowy and cold. Lucky for me then that I spent most of this time on a bike trip in PEI and Newfoundland, on Canada’s east coast, where the weather was far more conducive for biking. I arrived home just in time for another dump of snow but, by the official start date for coffeeneuring, the snow had melted and the air temperature smartened up a bit. So here goes my attempt to get in my 7 rides in 7 weeks for 7 coffees! Bike Friendliness: 3/5. Three bike posts across the street but nothing in front of the cafe itself. Weather: Sunny, 0C to start my ride but warming to 5C by the time I got home. Nice day for riding. 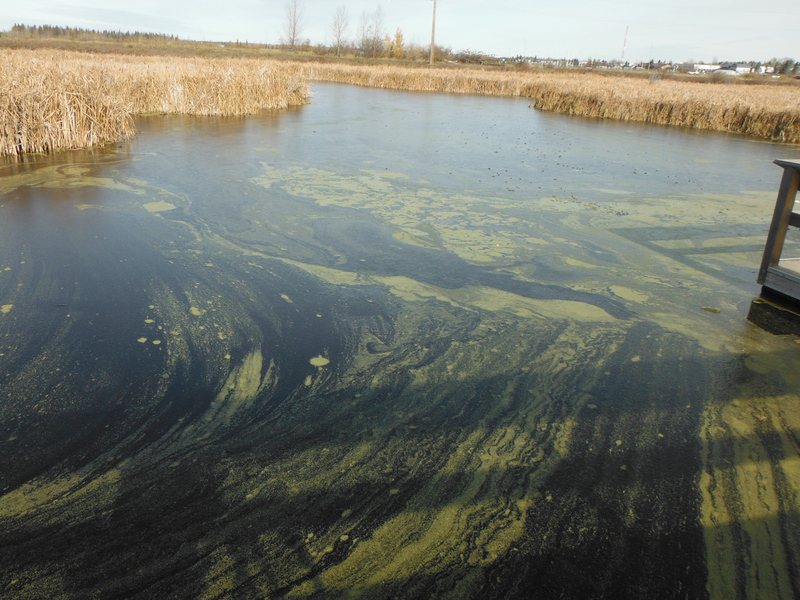 Duckweed on the storm ponds frozen into pointillism-like swirls. The trees are mostly bare now. No fall colours here. I love the frozen duckweed patterns in the ponds. Very artistic. A very humdrum latte. No art here! But it was warm inside, sitting in the sun. What: A coffee and chocolate chip muffin at the Tim Horton’s on the base. Bike Friendliness: 2/5. No bike racks, have to lean bikes against the building, but pretty safe. 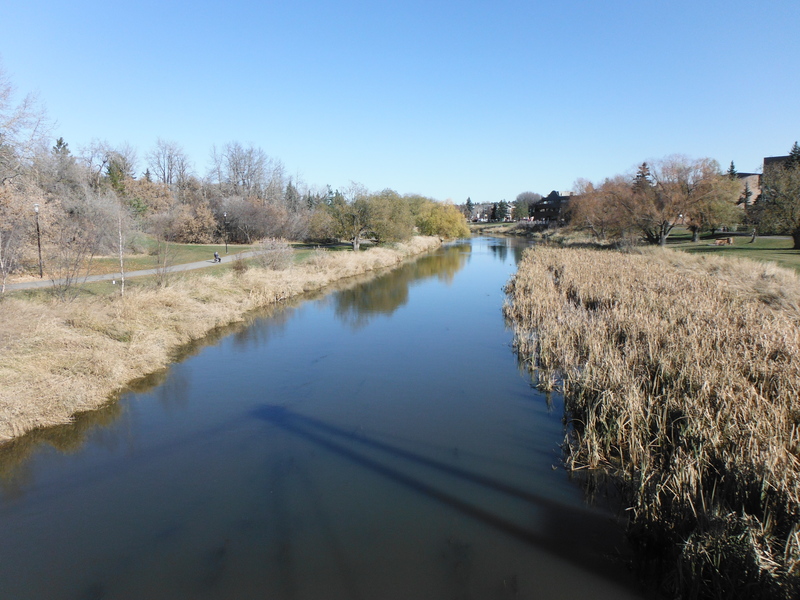 Weather: Sunny, 10C when started at noon but warmed to 20C by the time I got home. Abnormally beautiful fall day. Leafy trail through the woods on the way to the base. On the bike trail to the base. Field finally harvested after all that snow in September. 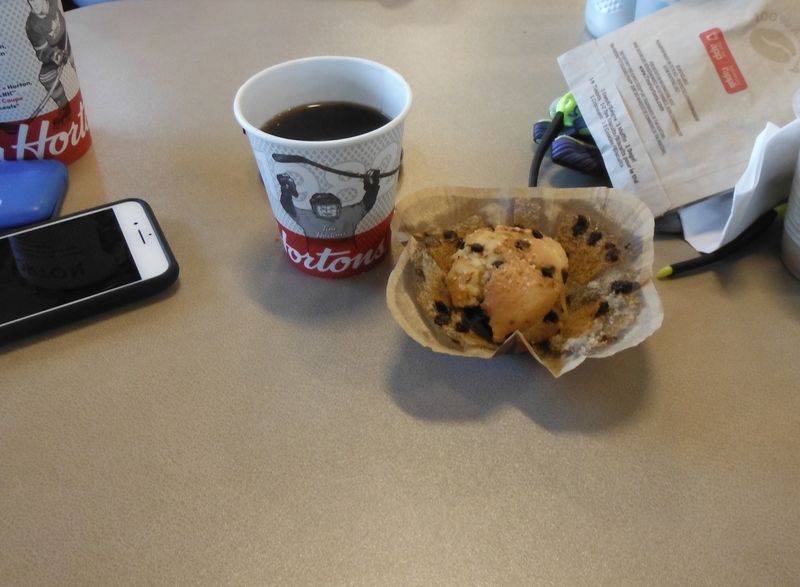 Small Tims coffee and chocolate chip muffin – my usual treat at the 38 km mark. Bike Friendliness: 2/5. No bike racks but lots of bolted down steel chairs to attach a bike to on a large accessible patio. 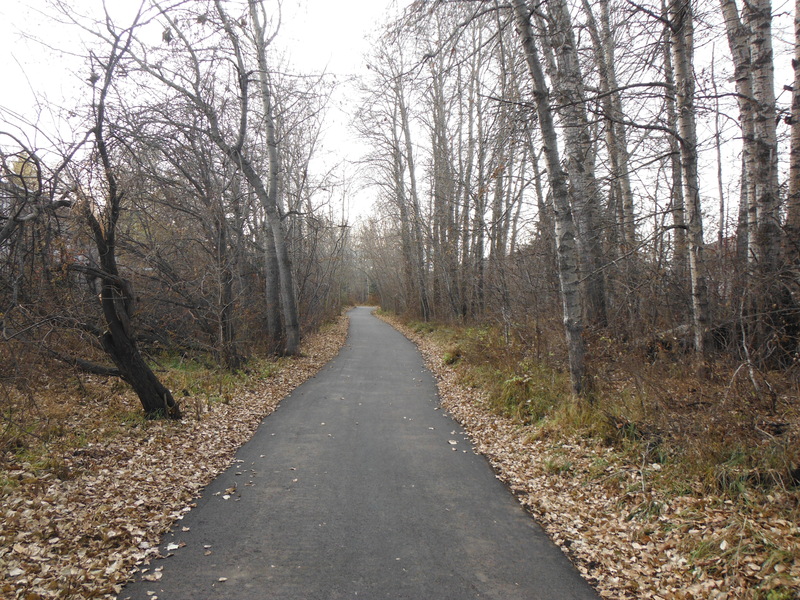 This place is one of our “go-to” stops on our club rides in St. Albert, when 40-60 of us show up. Weather: Sunny, 5C when started at noon but warmed to 10C at finish. 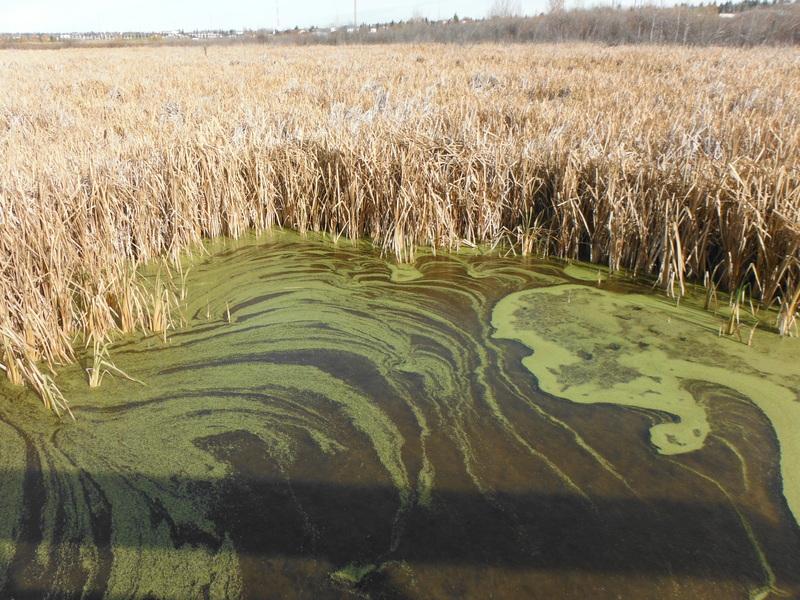 The Sturgeon River in St. Albert. Not much greenery anymore but no ice yet. Nice enough day to have my coffee outside in the sunshine, although I was the only person on the patio. Bike Friendliness: 2/5. One bike rack, which can accommodate a few bikes, on a common patio for the shops in the area. Weather: An overcast 8C with a cool north wind. The coffee was a nice warm-up. The only coffee they offered was a french press and I was not allowed to take it outside on the patio. Afraid of me running off with the press I guess. My bike just visible through the window. 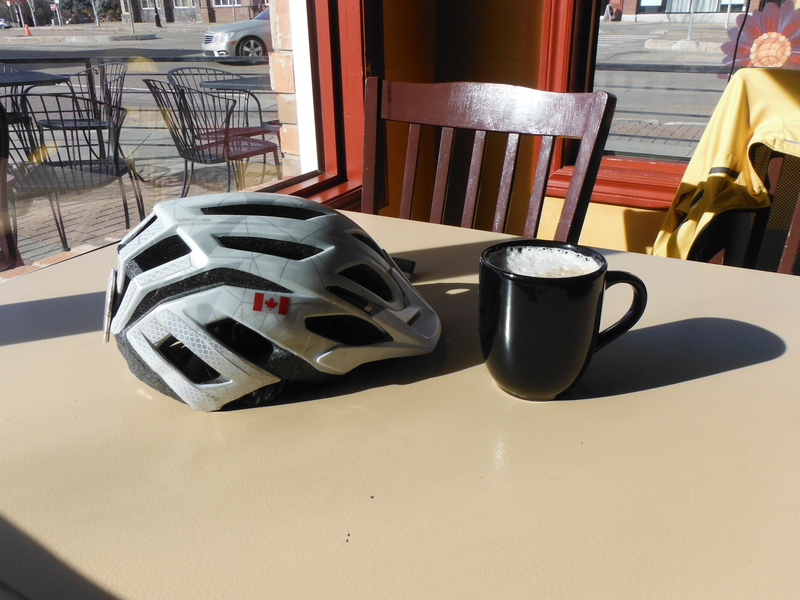 Although I went to the gym for a stationary bike ride and a workout, I needed to get this coffeeneuring ride in while the weather was still nice for riding. 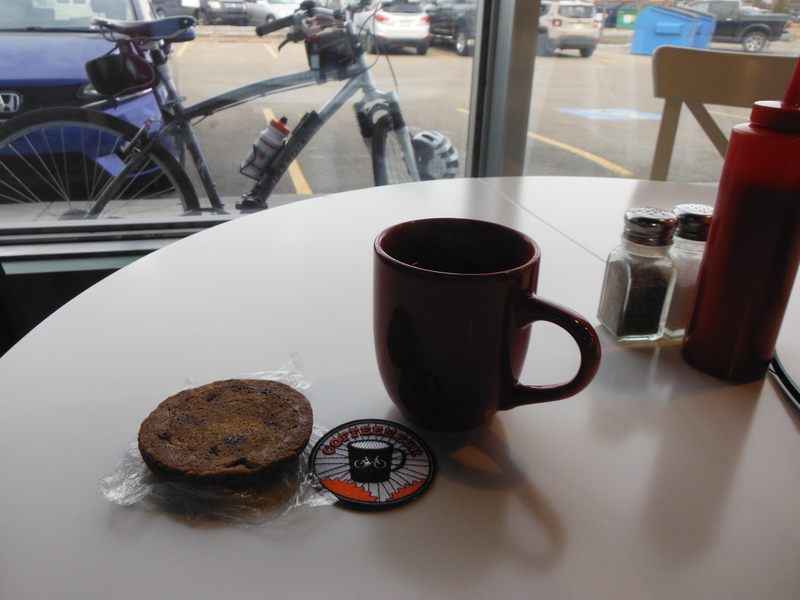 So I just did a short ride over to Juntos, a nice coffee shop in the Campbell industrial park. 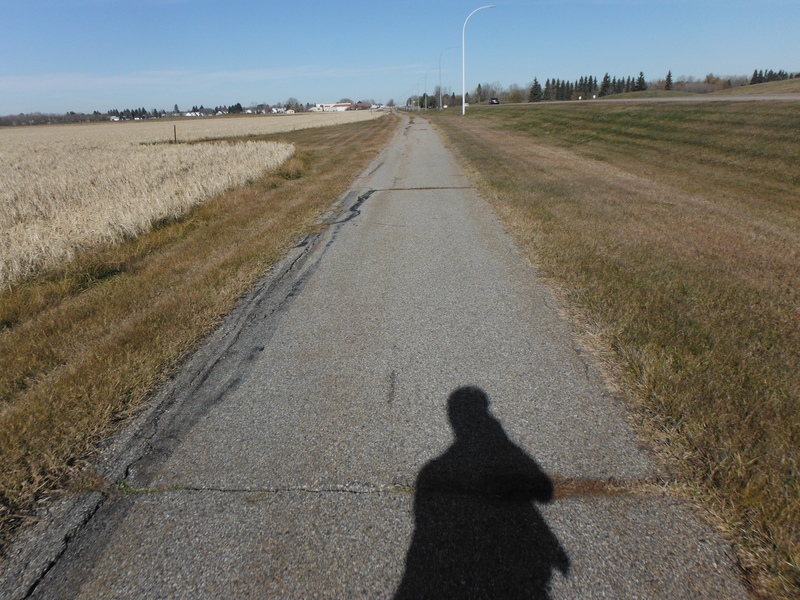 For a change, I rode up Poundmaker Road, a dirt road on the edge of St. Albert. 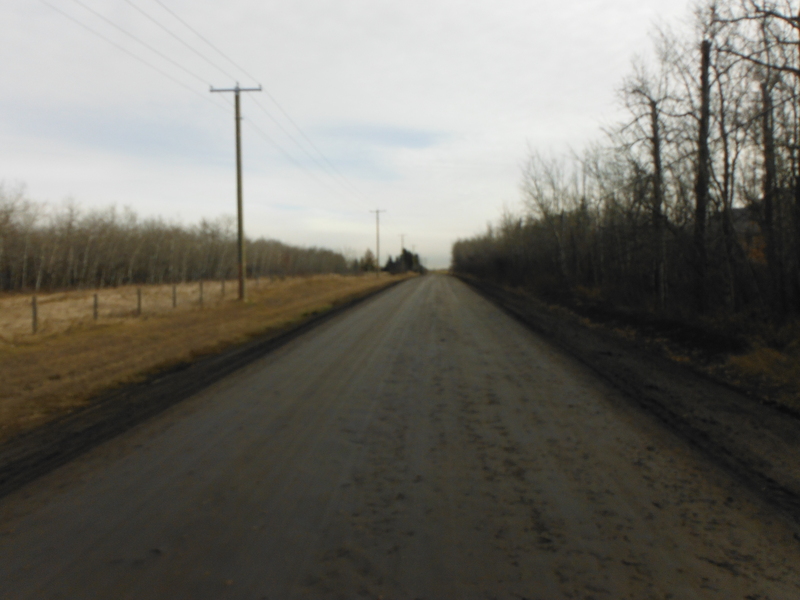 It had been recently graded and sprayed with calcium and, although a little slick, was not bad to ride on. If I didn’t have to get back home to prepare for the trick-or-treaters (carve pumpkin, get treats ready, etc), I would have done a longer ride. Bike Friendliness: 1/5. No bike racks at all even though our bike club takes up to 40 riders there on our rides in St. Albert. Gets kinda crowded in the parking lot with bikes strewn everywhere. I was the only bike there today though so just leaned it up against their window. Weather: An overcast 5C. Not much wind so it was really pleasant for riding. 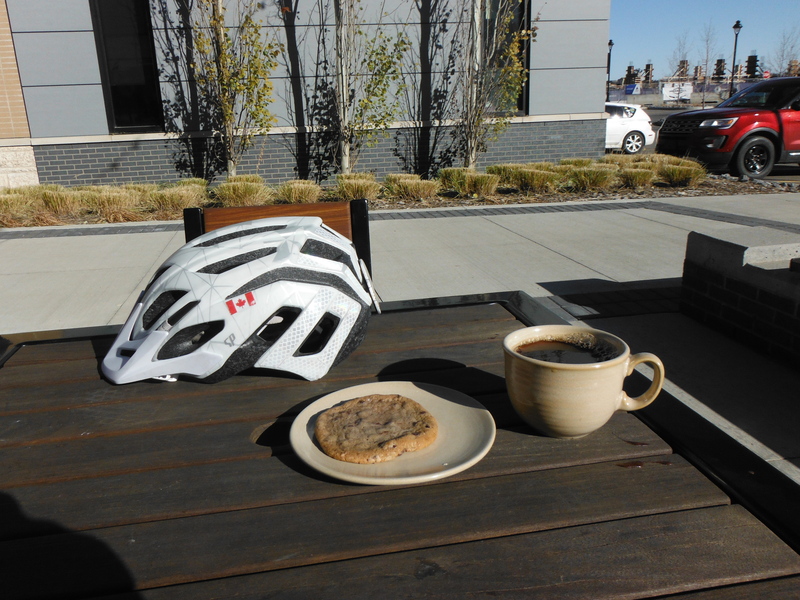 Coffee and cookie, with my bike patiently waiting outside. 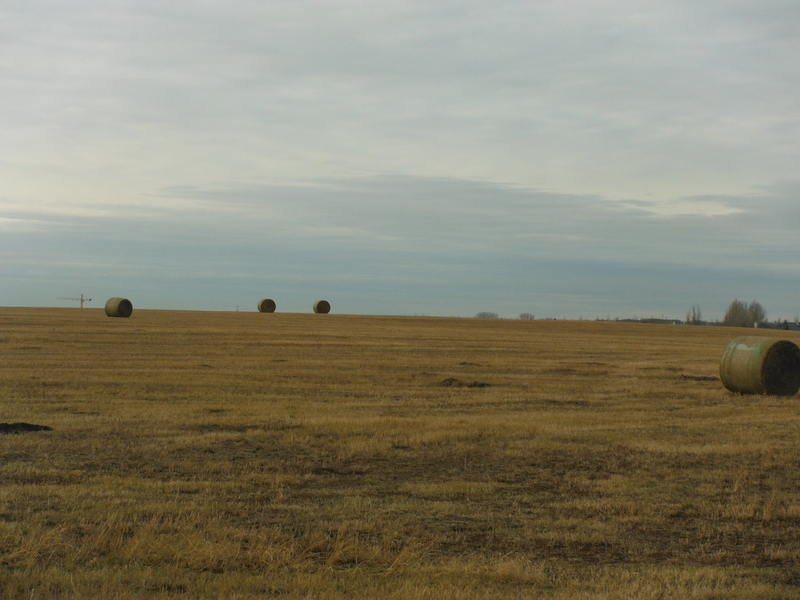 It has been dry enough, finally, for the fields to be combined. 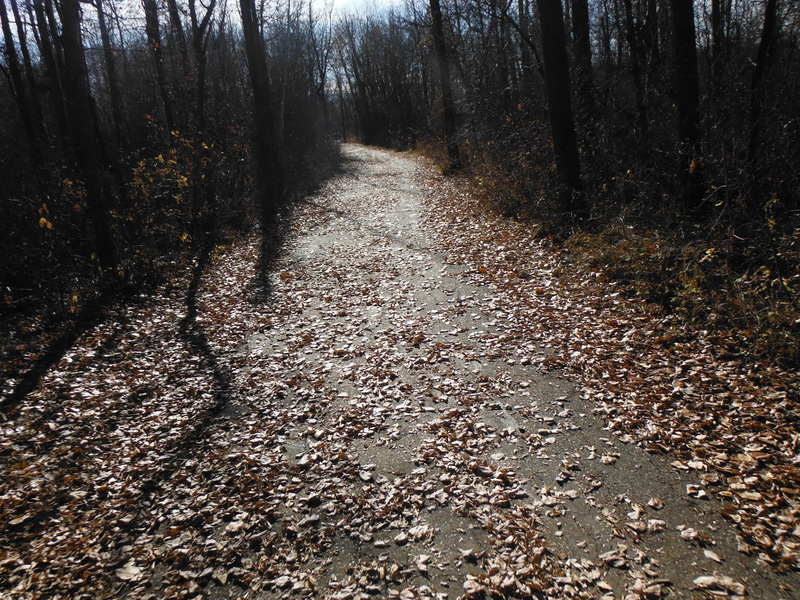 Bare trees but clean trail. Flurries in the forecast for tomorrow so it was good to get out today. 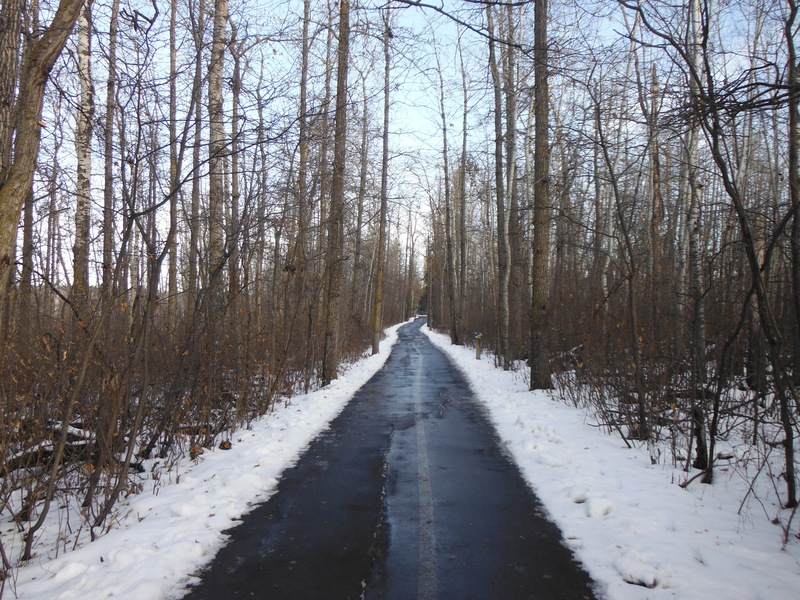 After 2 weeks of roller coaster weather – snow, followed by a partial melt, followed by frigid temps (-20C wind chills), then more snow, and repeat ad nauseum – I was finally able to get out for a ride. The streets and paths had melted off enough to ride, although I took it pretty slow going around corners. It started out sunny and +5C and ended up overcast and +4C by the time I got home, but still felt great to get the bike out again. Took advantage of the “coffee shop without walls” rule. 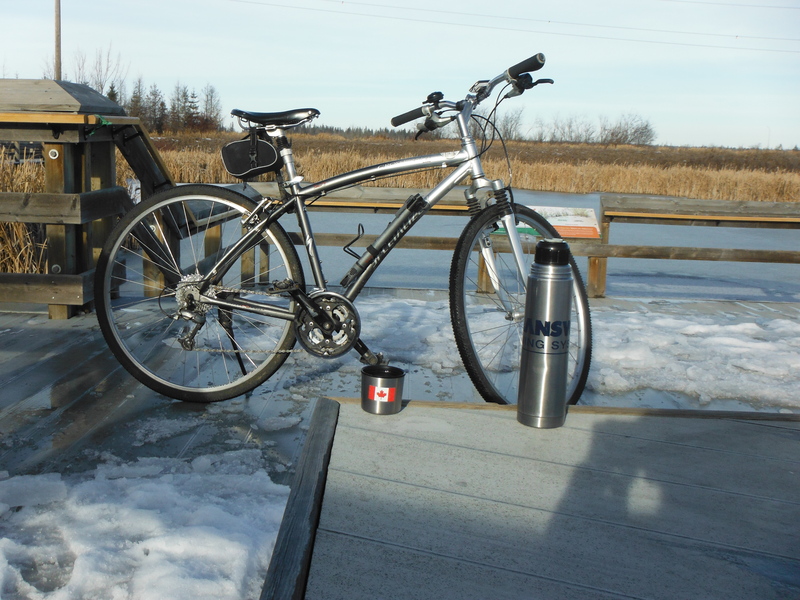 What: A coffee on the Poole boardwalk in Lois Hole Provincial Park, St. Albert. Bike Friendliness: 1/5. No bike racks, it being a boardwalk through a wetland and all, but lots of observing areas to park a bike and um, observe. Weather: A sunny then overcast 5C. 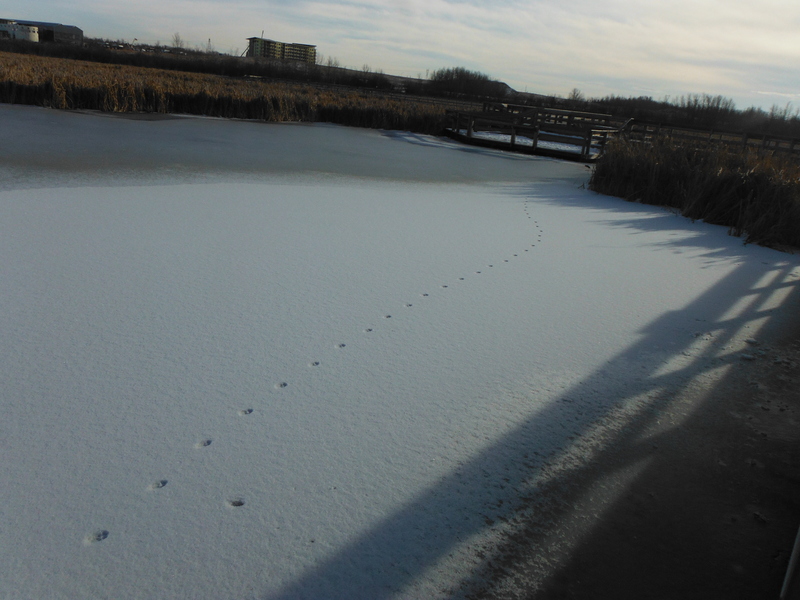 Critter tracks on the frozen ponds. Probably a fox looking for any waterfowl that got caught in the last freeze. My bike on the snowy, though melting, observation boardwalk. Nice place to sit and have a coffee. The path was wet but not icy. Yet. That skim of water will turn to slippery ice by the evening. 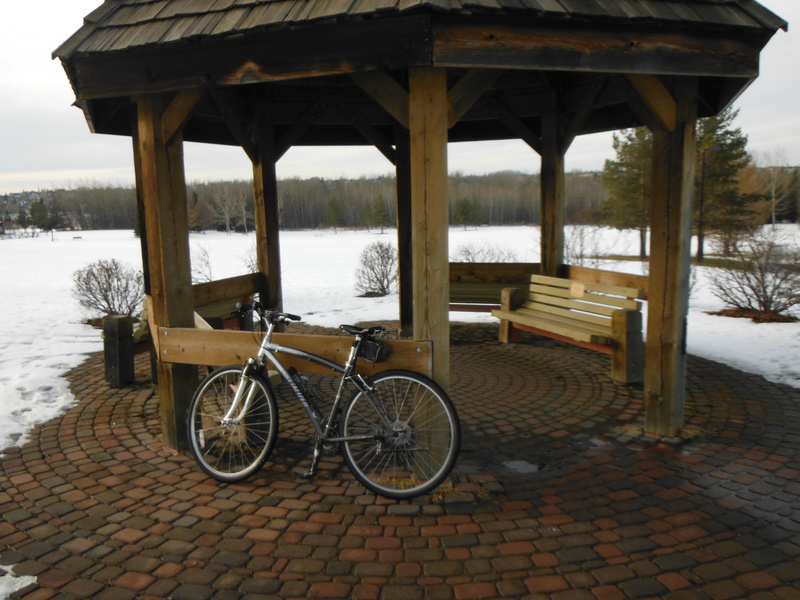 It was touch and go whether I would be able to complete the challenge this year but a few days of thaw enabled me to take an embarrassingly short ride out to the gazebo at the north end of the Red Willow Trail in St. Albert. With no fat bike or studded tires, I took it pretty carefully on my completely iced up residential street. The main roads and the Trail were mostly ice-free but it still required my full attention to make sure that I stayed vertical. There were still a few sneaky ice patches lurking in the shadows ready to do me harm if started to get complacent! My target destination was the final rest stop that we use on our weekly road rides in St. Albert – a gazebo at the north edge of town. This ride approached it from the opposite direction from what we usually do and after a considerably shorter ride. 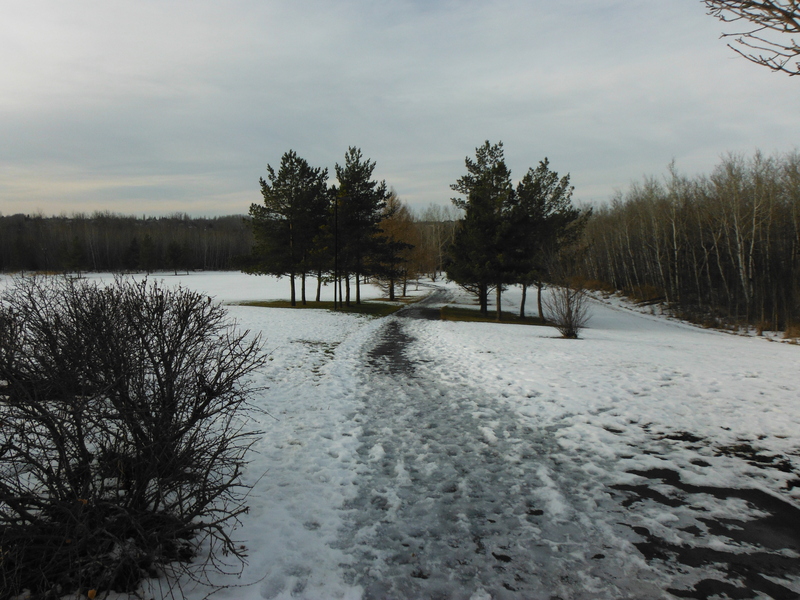 The city had not cleaned off the trail in that part of the park and it was mostly glare ice for the last few hundred metres but doable with care. There is no coffee shop anywhere nearby so this was another “coffee shop without walls” ride. What: A hot chocolate at the gazebo in Kingswood Park, St. Albert. Bike Friendliness: 3/5. No bike racks but lots of room to lean bikes on the gazebo and bushes surrounding it. Our summer rides have had as many as 12 bikes comfortably and safely resting. Weather: A partially sunny 4C. My icebound street. 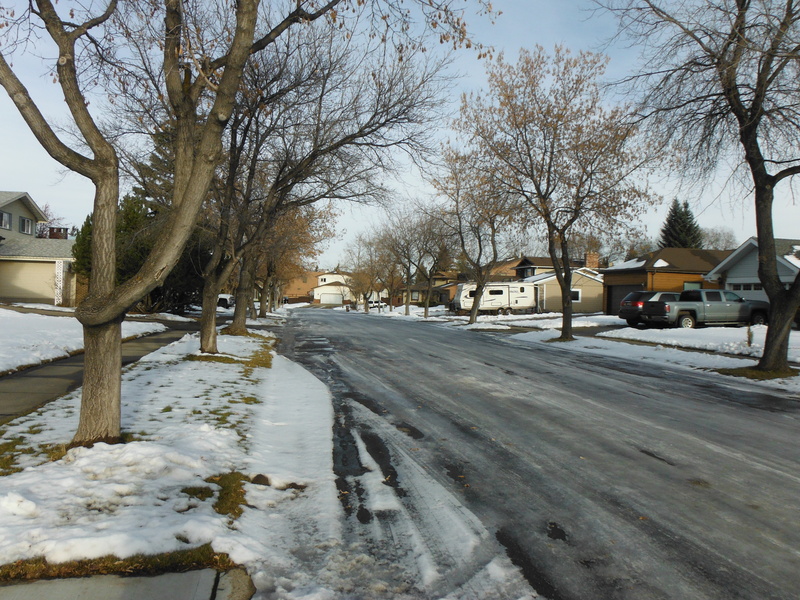 Sidewalk was mostly ice free but the street needed my careful attention. The gazebo – a dry island in a field of snow and ice. The approach to the gazebo was a little slick. That is solid ice, not slushy at all. Slow riding. 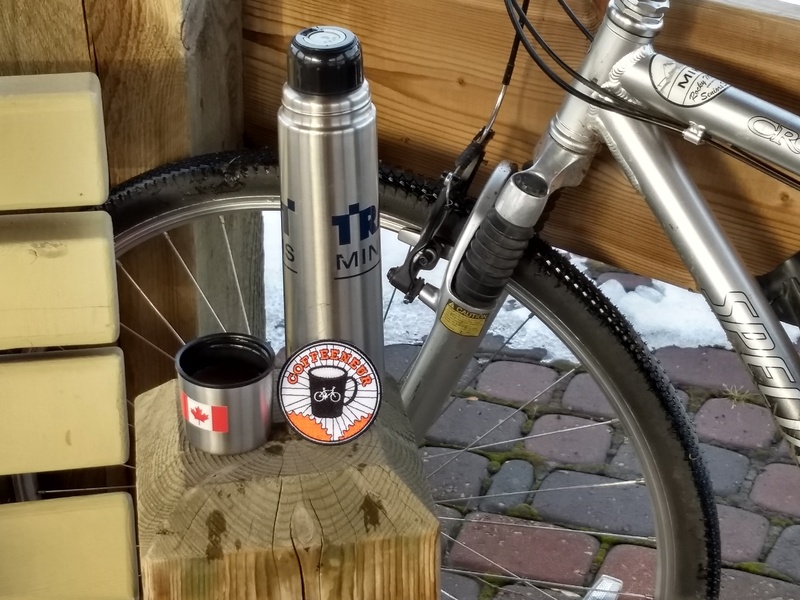 My thermos of hot chocolate and coffeeneuring patch from a few years ago. 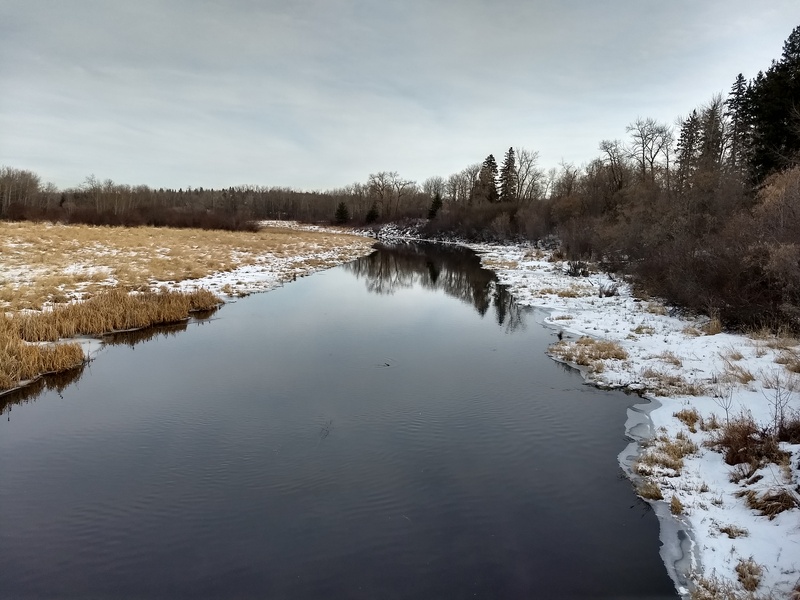 The Sturgeon River ice-free again. Has been frozen and thawed multiple times already this season with our roller coaster weather.